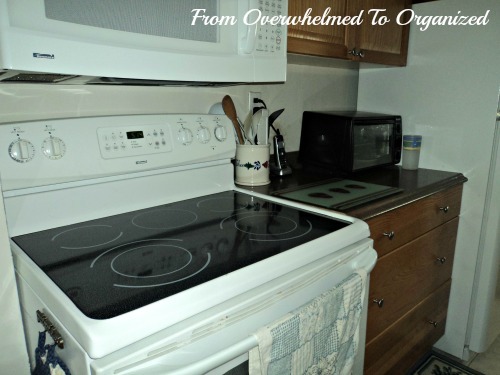 I've been meaning to do an update post to show you the after pictures and give some tips on how you can cope and not get as overwhelmed during those particularly busy times when "life" happens. Only I've still been quite busy so I never did. Yesterday, I finally went to get started on the update post. But, when I went to delete what I thought was a draft of a post I started earlier, I actually deleted the original post with all my messy house pictures. And I haven't backed up my blog recently. Because, well, life's been busy. 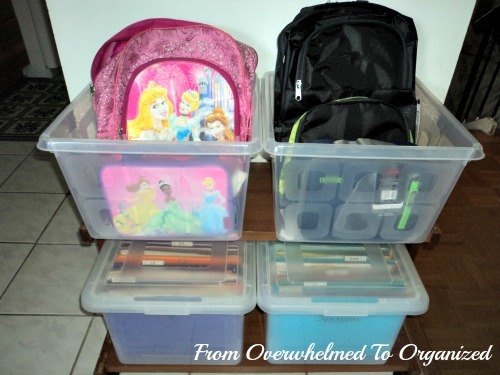 Back to school, sick kids, new organizing clients. You know how how it is (well your busy things will likely be different than mine but you get the idea). Yep. The post was gone. Grrr. After spending all day yesterday asking questions in FB groups and online forums, and Googling like crazy, I was finally able to access the content of that post in a cached form. I lost the original comments and pageviews, but at least I was able to re-publish the content of the post this morning. It's frustrating to make stupid mistakes like that. But even more frustrating that I hadn't backed up my blog lately. I could have saved myself hours and hours of work if I'd just taken a few minutes to do a simple task a few times during the last few busy weeks. So there's the main tip in this post. Even when life gets busy, and you can't do everything you usually do, you still need to do SOME important things. What those things are will be different for each of us. But whatever they are, it's vital that they get done. I know deleting that post isn't the end of the world. It could have been worse. I could have lost all my pictures that I've taken since I last backed up my pictures (note to self: back-up pics ASAP!). Or even worse... something could have happened to my family. At least it was "just" a blog post. And I only have myself to blame for not backing up my blog and for not being more careful before deleting a post. But it was an important wake-up call, that even when I'm really busy, I need to do at least the bare minimum to stay afloat. If you're overwhelmed during a particularly busy period in life, here are a few strategies that might help you keep your head above water. 1. 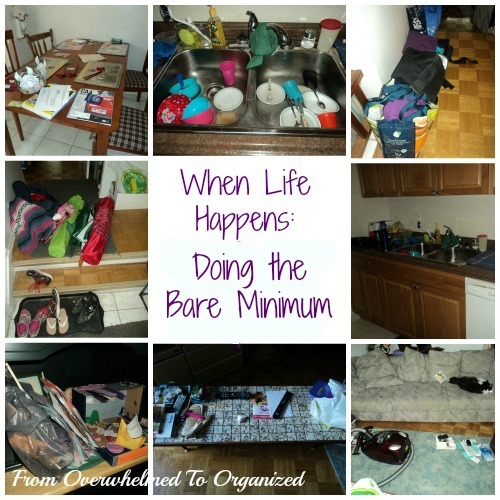 Figure out what your "bare minimum" is. Knowing what bugs you the most will help you stay on top of it. It also gives you "permission" to not do some of the other things that you feel like you should be doing, which will help you not feel as guilty or overwhelmed. If you've got 5 minutes after breakfast before you have to get out the door, use that time to empty the dishwasher and get your breakfast dishes loaded back into it. 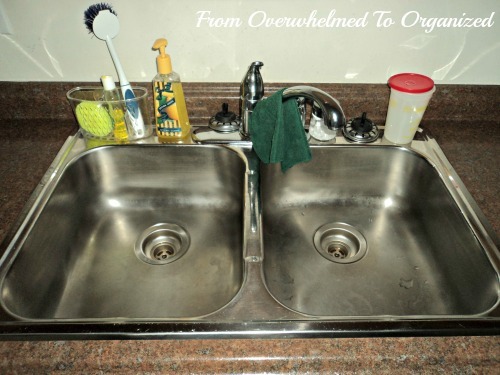 Because who doesn't feel better coming home to an empty sink rather than having to deal with dirty dishes before you can make dinner?! 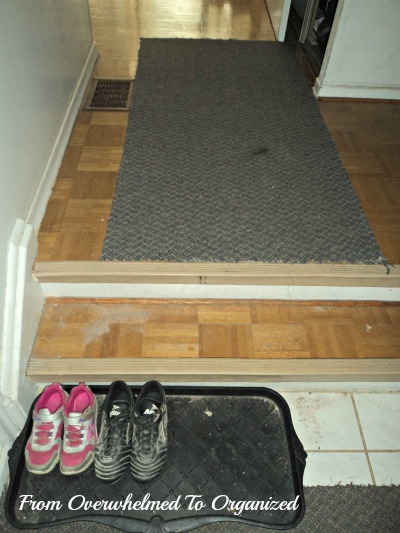 If you have 3 minutes while you're waiting for your kids to do all their last minute tasks before school, spend it decluttering your entry area. 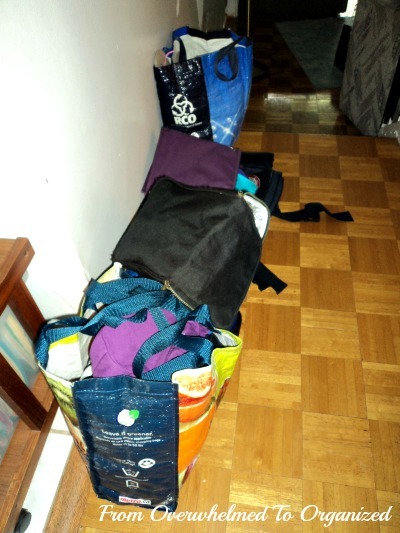 There will be enough new stuff coming in the door after school and clearing up what was dumped there yesterday or the day before or last week will definitely help you feel less overwhelmed. While you're waiting for your coffee to brew or your water to boil for tea, wipe your counters and the kitchen or dining room table. Toss in a load of laundry while you're on the phone with a friend (or a telemarketer). When you put your feet up in the evening, do a quick declutter of the living room or family room during the commercials of your favourite "guilty pleasure" show. 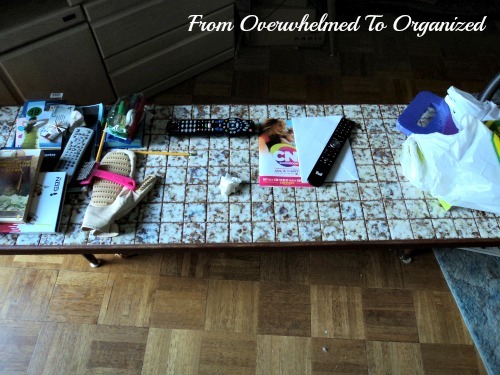 Every time you leave a room, take 2-3 items with you that don't belong there and put them away. 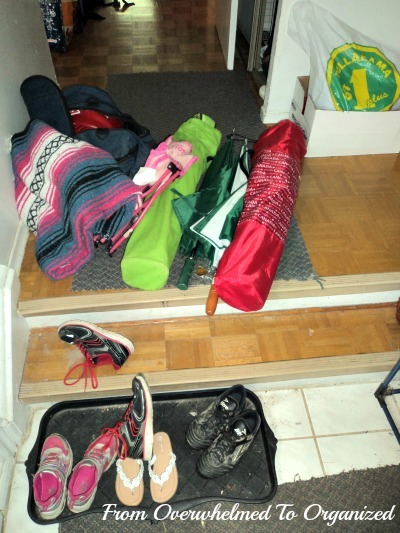 Similarly, every time you go up or down the stairs, take something with you that belongs on the floor you're going to. You can put baskets at the top and bottom of each flight of stairs to help with this. 3. Set a timer for 10 minutes and see how much you can finish in that time. This is particularly good if you have some time, but you're feeling like you've got too much to do (and all you want to do is crash for awhile!). 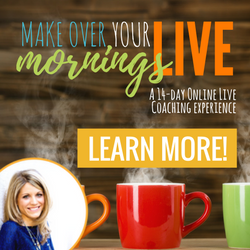 It's amazing how much you can accomplish in short bursts (see the list above!) and racing that timer will keep you going. This also really helps with tasks that you think will take a long time, so you keep putting them off until you have "more time", only that never comes! Getting started is the biggest hurdle. And once you get going, if you want to do more, just set it for another 10 minutes. 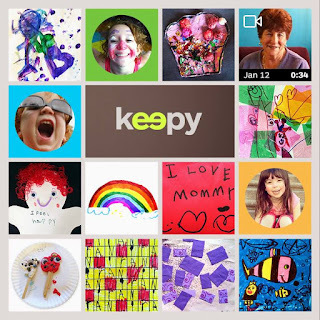 Get the rest of your family involved too and see who can put away the most things in 10 minutes. Note: Doing the bare minimum is NOT a long term solution and it should not become a way of life! 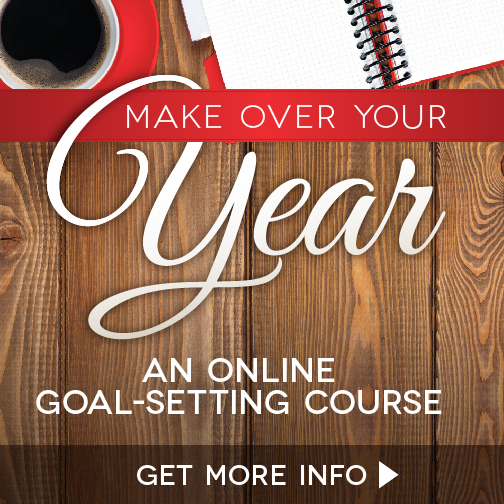 If you are in "bare minimum" mode for too long, it's time to look at how you're spending your time and make some changes to help you and your family function in a more healthy way. I took a few days after I posted my messy pictures to get caught up. Some things I finished right away and others took a few days. 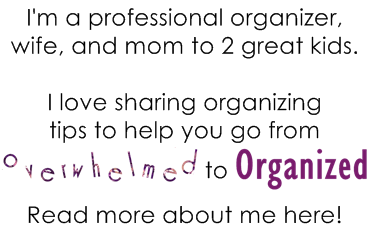 Because honestly I was tired after working so much all summer helping other people declutter :) Plus, my kids and I were finally all home together and only had 2 weeks to fit in lots of activities from their summer lists. 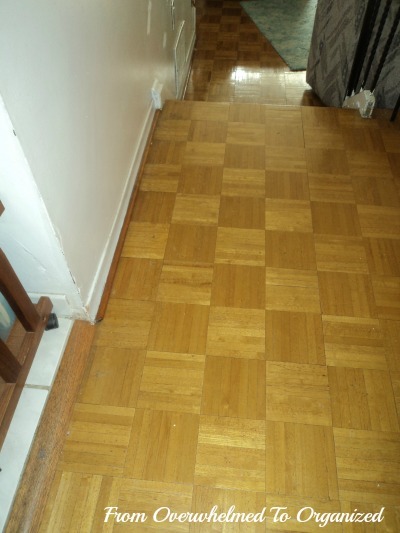 And just up the steps, here is the hallway before. 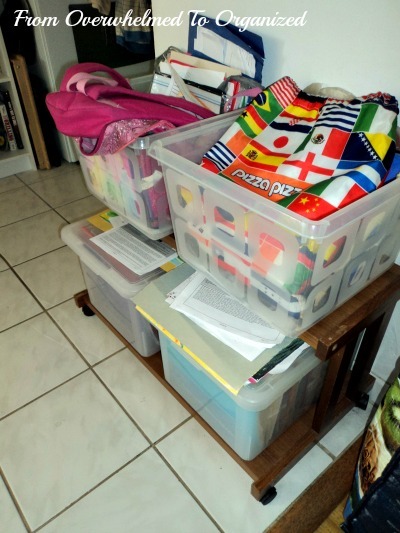 Our school file bins were overflowing with last year's school work before. 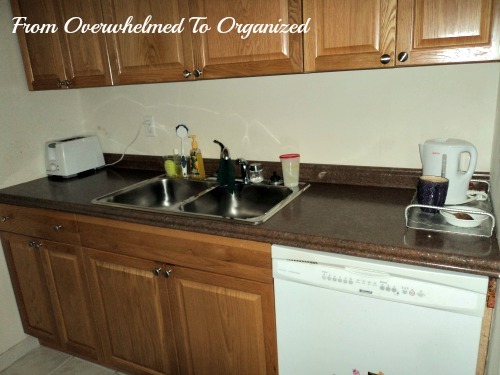 My kitchen counters were a mess before. Here's the stove side before. Here's the other side before. 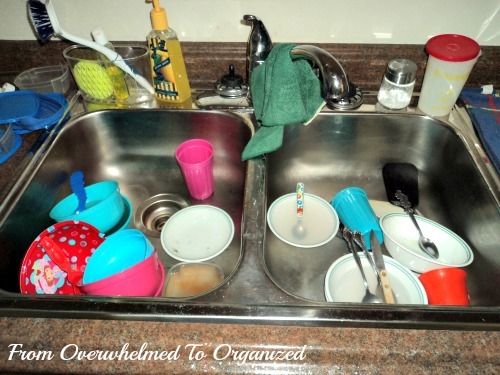 Remember this sink of dirty dishes? My living room table was cluttered before. 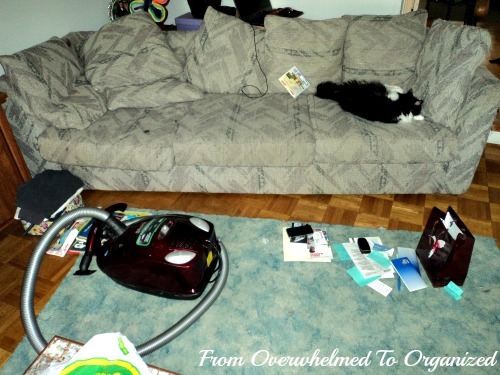 The rest of the living room was cluttered before too. But it was tidied too (there are still a few projects in the corner that I'm working my way through). The only area we didn't tackle was the pile of crafts from my kids' daycamps this summer. I forgot about it on the day we sorted through their school files, but we'll get to it soon. September is still a busy month, but I'm making sure I stay afloat by keeping my hallway, living room, and kitchen tidy and clutter-free, backing up my computer and blog, and keeping up our menu plan and weekly notes. In between crazy times, I'm working on cleaning. And once we get into our fall routines a bit more, life will settle down a bit. How do you stay afloat when life gets busy? 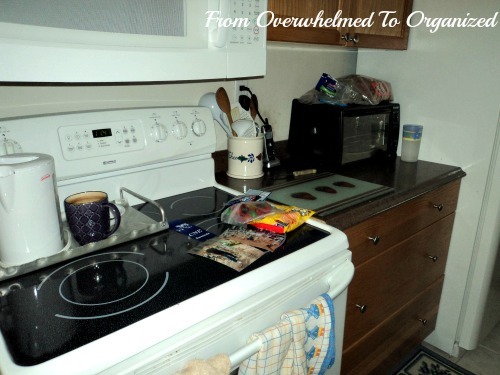 What are your "bare minimum" tasks to help you not get too overwhelmed? Please share your tips so we can all keep our heads above water when we need to! Glad to help! Hope you're able to find a good solution. Oh my GOODNESS can I relate! It seems like everything is going just fine and then my house implodes! Thanks for all the encouragement and quick tips! You're welcome Lisa! It's amazing how quickly things get out of control sometimes, but it's good knowing it happens to everyone and that doing a few things can make a big difference. 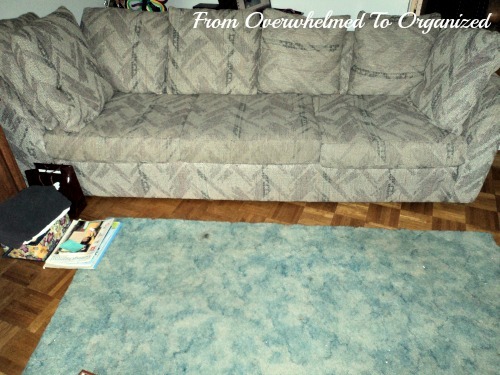 Very nice collection of "after" photos - so inspiring! I love those clear floors:) I think at some point we all experience losing something on our websites -- never a fun event! Thanks Seana! 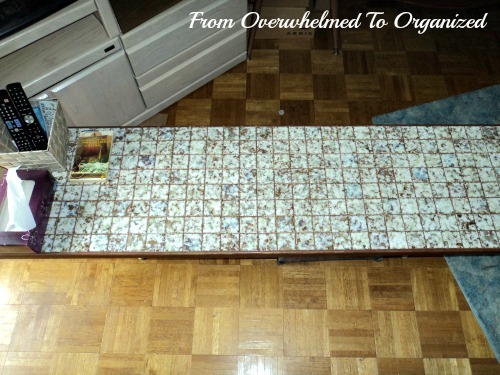 I like the clear floors too :) And hopefully I've learned my lesson on losing website content... so frustrating! Thanks Hilda, Yes even Professional Organizers get behind. I can relate. I've let my bookkeeping get behind and I have a mess in the garage that is screaming at me. I know that doing little bits to stay on top is the best solution. Its also great that when you do have good systems in place the recovery time is minimal. 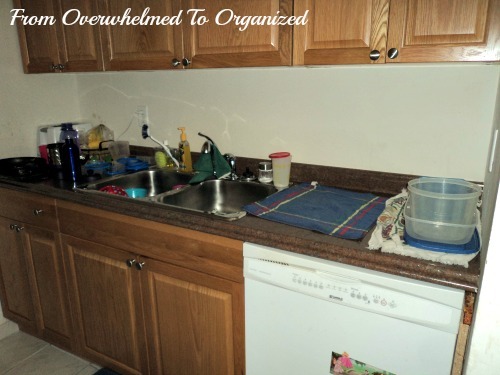 It definitely makes a big difference in recovery if you've already established organized systems and just have to refresh or catch up when you get busy! 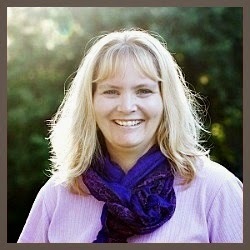 Good luck with your bookkeeping and garage! How awful to hear all you had to go through to retrieve this post! But I'm glad you got it back as your pictures are so transformative and motivating! As empty nesters with a very quiet lifestyle, I can barely remember the last time my life was busy enough to have an impact on my home. But I do remember years ago when I was a commuter, being out for 12 hours a day and too tired to even do dishes, letting them as well as whatever I brought home with me pile up all week to deal with on the weekend... I'm glad those days are done!